These photos were taken with my mobile phone in order to save time and make blog-writing easier. Hope the downgraded image quality won't spoil my identity as a professional photographer as well as digital image specialist. I always carry a few pens with me so I have the need to find some good pen porches for them. 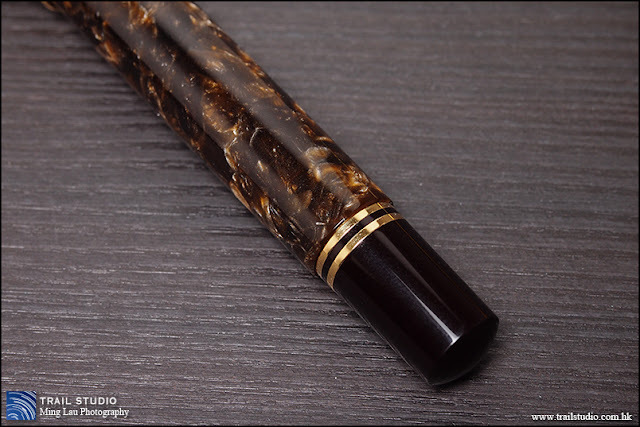 The pen porch shown in my previous Pelikan M800 Review (Here) caught some friend's attention and asked me about it, so I decided to write this review. Telling from the exterior, this is an eye-catching, high quality leather article. 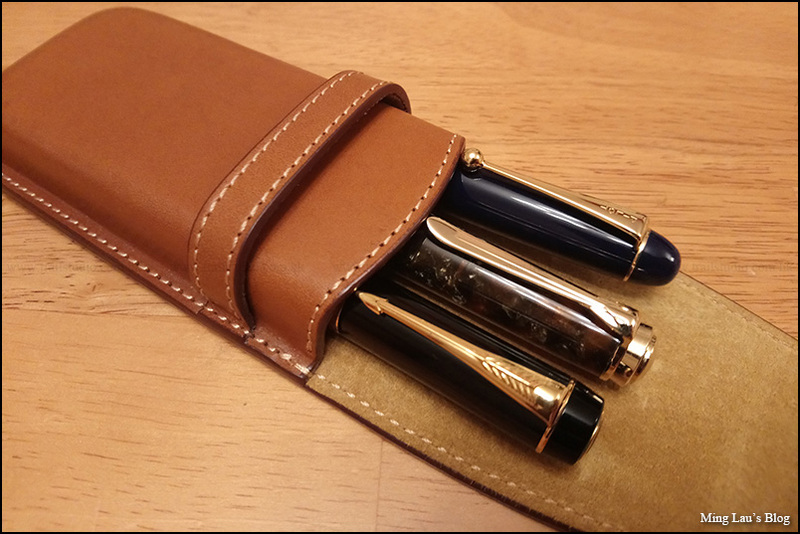 The hardened leather seems almost bullet-proof, very promising in offering the best protection to our beloved pens, l was sold. It is a good leather article, but it may not be the best all-rounded pen porch. 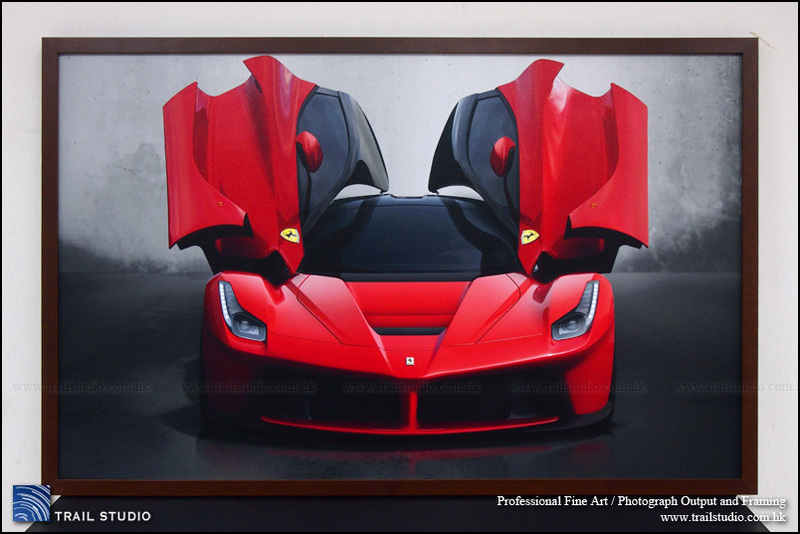 Well, the material, craftsmanship and the eye-catching factor all worth the price, but my little problem with it mainly lies in the design department. The porch has minimal branding, just a stamp at the back. 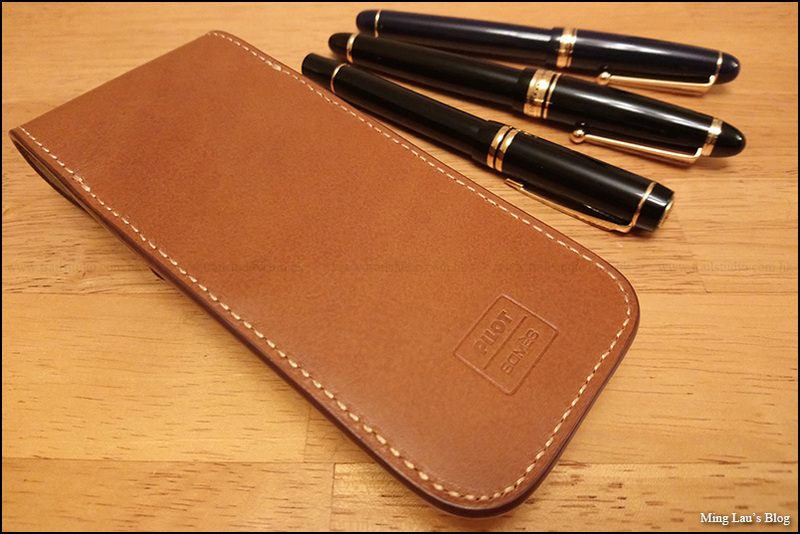 The stitching is very nice, the light brown hard leather looks cool, feels very nice to the touch and sets this one apart from the majority of pen porches that are made of soft leather, but this hard leather may not be the best material for fountain pen porch - it is very absorbent to water, that means it can be easily stained by fountain pen ink. Perhaps the black version is more stain-resistant. Here comes another little problem with the use of hard leather, the cover always bounce back to its closed position(to take this photo, I spent some effort to make it stay open...for merely 1 or 2 seconds). No big deal but if the cover can stay open or be flipped backwards when the pen porch is set on a desk, it'll be more convenient to switch between pens. This pen porch is not a very large/long one. 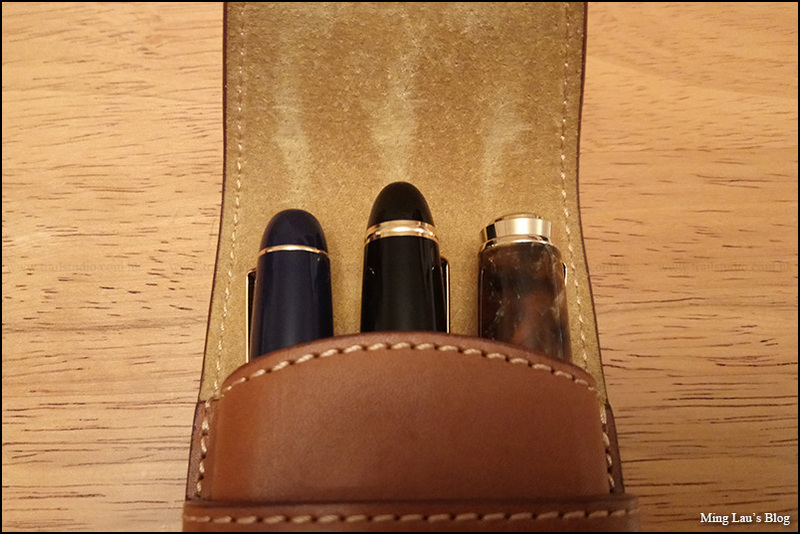 The pen in the left is a Pilot Custom 74, while that in the middle is a Pilot Custom 743. This is a PILOT pen porch but IMO is a bit too short for her own 742/743/823/845 or the Namiki pens, especially if you put these pens in the side slots - which are narrower and shorter because the bottoms are round. If you put a long pen in the side slots, a large portion of its cap will look quite exposed to air and not feel like being very well-protected. I feel much more comfortable to put the shorter Platinum 3776 or Sailor 1911s in the shorter side slots, rather than a Pilot pen. 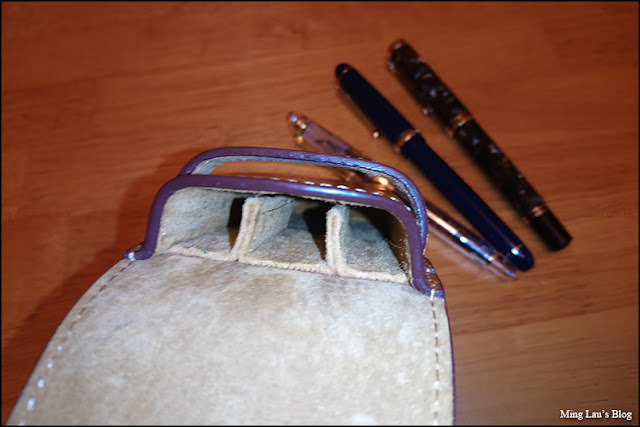 The official photo of the pen porch was taken with some Custom74s clipping to the leather and stay put, however, in reality the leather is too thick for most (including the C74) pens to clip practically, pens with spring-loaded clips can clip easier but they look weird with the clips springing very wide, and the added thickness of the clips makes inserting the porch cover into the belt a lot more difficult. The clips will easily leave permanent marks to the leather too. I'd rather let the pen clips stay inside the slots. While the exterior of this pen porch looks almost bullet proof, the internal partitions are way too short, they extent not more than half-way down the porch. As the leather is too thick for a pen to clip on it and stay put, there's a very high chance for many pens(depending on shape and girth) to wobble and hit/press on each other at both ends, one of my wooden pens had actually been damaged this way, there is a dent on its cap, very likely caused by the clip of the pen next to it. It's better to select short, girthy, rod shape penes which fit the slots perfectly to minimize wobble. 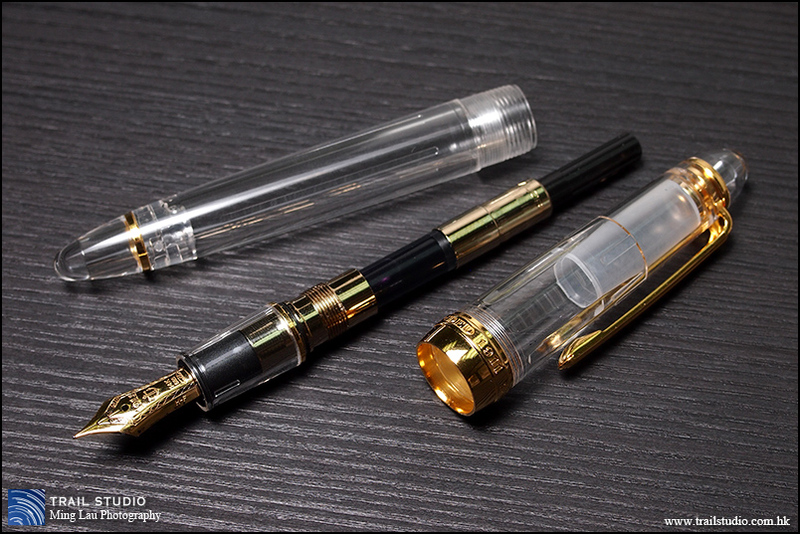 I would never put metal pens together with plastic (or precious resin XD) pens in this pen porch. 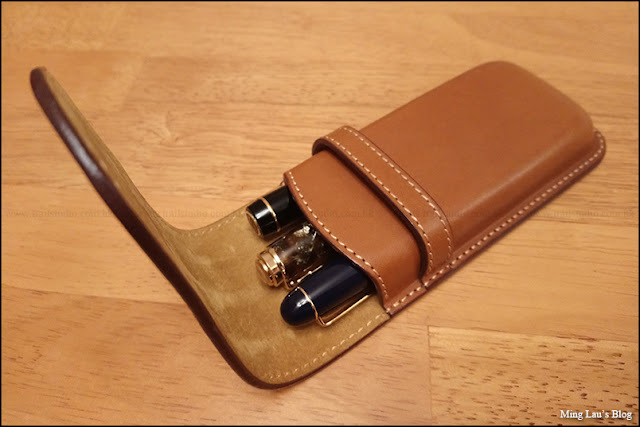 This pen porch is very eye-catching and very nice to the touch, the hardened leather seems to offer very good protection from external factors, but pens hitting each other within the porch can potentially cause damage, this is. disappointing especially as it is the most expensive pen porch Pilot offers, in which the price is more expensive than a lot of other luxury brands. It's still a good pen porch but you need to pay serious attention to select the suitable pens for it. I feel that the big problem can easily be solved if the overall length of the casing be extend by just 5mm, and the length of the internal partitions be increase to at least 3/4 of the entire internal length of the porch, this will then be a great pen porch for a lot of pens. Ming Lau @ Trail Studio Photo Printing & Framing Service, Hong Kong. Coming from the other side of the Pacific Ocean, The Ministry of Culture of Peru will be organizing a photography exhibition in the Hong Kong Cultural Centre, and it is an honor for Trail Studio to be the photo printing service provider of this exhibition. 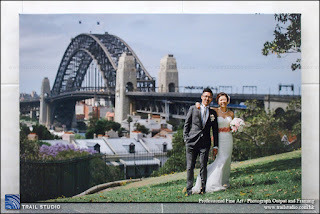 By participating in this exhibition, we are proud to be able to realize our core value – a life-like photo print helps define photography as art, as well as an effective means of communication between people speaking different languages and living in different places, and to record history. The Director of Arts of the Ministry of Culture of Peru is pleased to introduce Julia Wong Kcomt, Peruvian poet, writer, curator and cultural manager who is currently promoting the photographic exhibition "From Porfirio Diaz to P F.Chang, 100 years of Chinese migration in Mexico 2017 "to be held at the Hong Kong Cultural Center in August 2017. 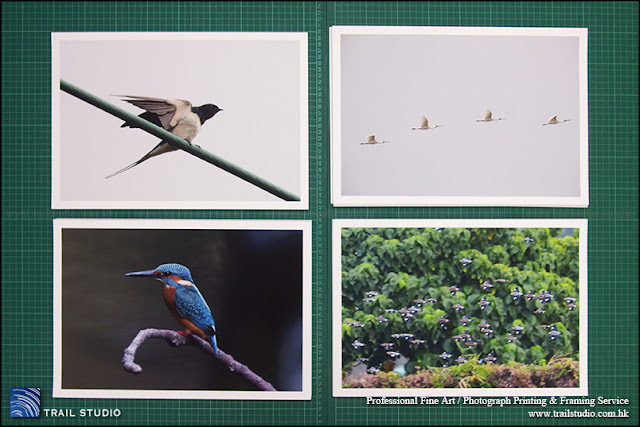 This exhibition will feature the works of Peruvian photographers Carlos Paz Carbone, Laura Luz Correa and Alberto Phumpiu, with images from the Argentinian Photographer Matias Salgado, and will be curated by Julia Wong Kcomt. 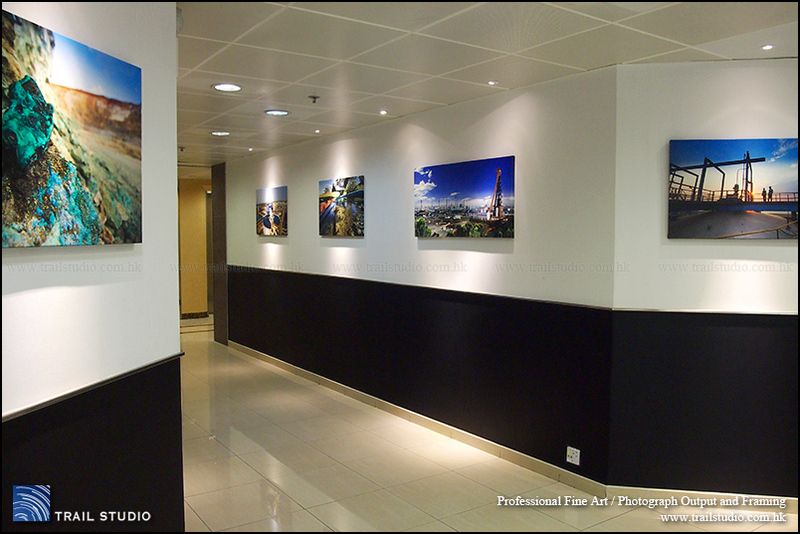 We consider important the realization of this photographic exhibition, being an opportunity to promote Peruvian photographers abroad. 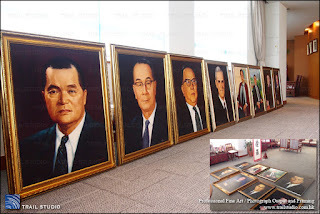 But most of all for us is capital to develop the concept of understanding History in the process of Cultural dialog between Asia and Latin-American. These four photographers did a deep research about the dramatic knitting of relationships between the first Chinese People arriving in Baja California,(at the beginning of 1900), and then how things started to melt with the new Culture. 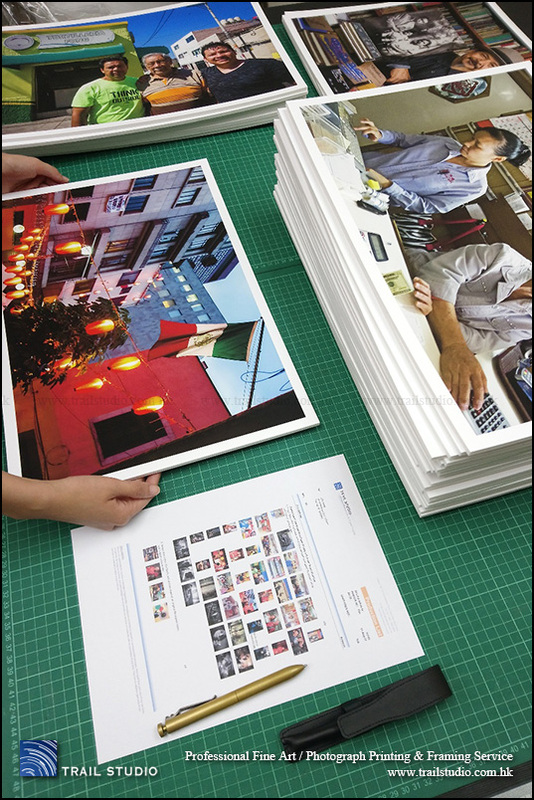 Peruvian Photographers are very familiar with Chinese migration, because the Chinese community in Peru is the largest and well rooted in South America. This exhibition is a multilevel Bridge between two Folks and their different approach to the concept of time and how the official Story was told. I always tell myself that I don’t need so many fountain pens, I always tell myself that some very cheap Chinese Fountain Pens actually write quite well especially after I fine-tune them to my liking, and I always tell myself that a piston-filler pen is just a springe with a nib attached. I even always tell myself that while I like big fat pens, the M800 is too fat for my small hands.But it turned out that when Pelikan announced the release of this M800 Special Edition, I was attracted by the promotional-photo and immediately pre-ordered it. There’re many reasons for people to love a Pelikan, but I got my own special reason for not being able to deny this pen: The guys from Pelikan set the pen on a high-quality, classic picture frame and shot the promotional-photo! We’re in the professional Photo Printing & Framing business, that photo drew my attention to this particular pen - it looks like this is THE PEN for picture framer, the theme of this pen matches our business very well. 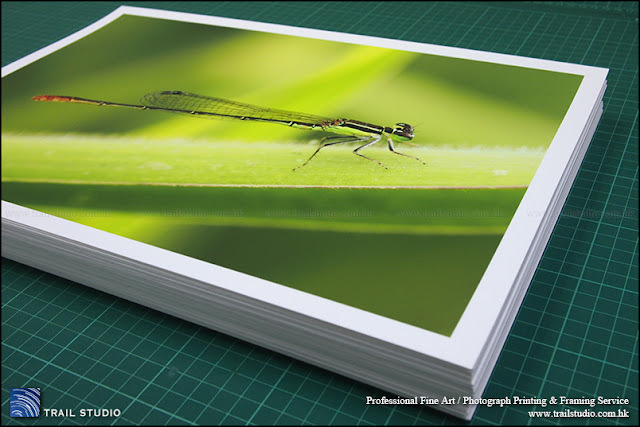 Moreover, we do a lot of our art/photo printing jobs on Germen papers with customers’ great satisfactions. It’s natural to love German pens when we love German papers. “German-engineering”, what else? For those who are new to the fountain pen world, here is some of my brief knowledge about Pelikan, Pelikan is the family symbol of one of the early owners, and the firm started as ink manufacturer and later switched to the production of fountain pen with a patented differential piston-filler mechanism. 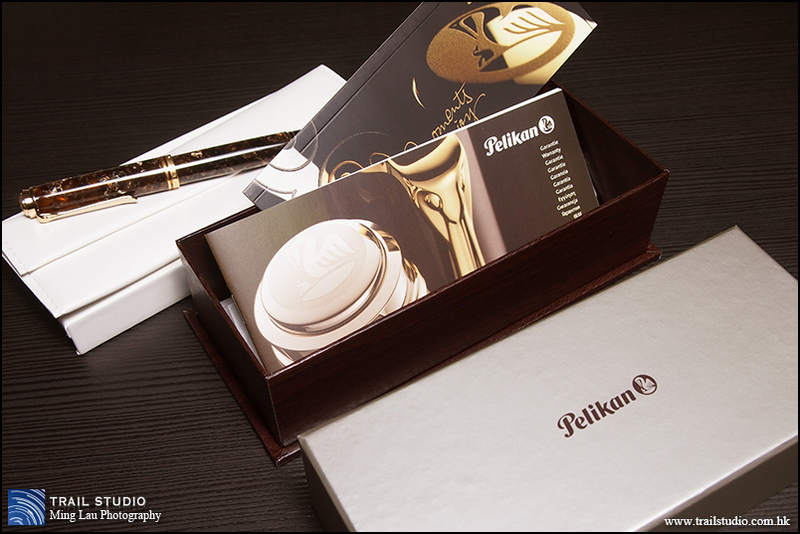 Like many other pen manufacturers, Pelikan underwent up and down throughout the history, and the ownership was transferred several times, but nowadays it still be able to maintain its reputation as one of the best German-quality pen manufacturers. 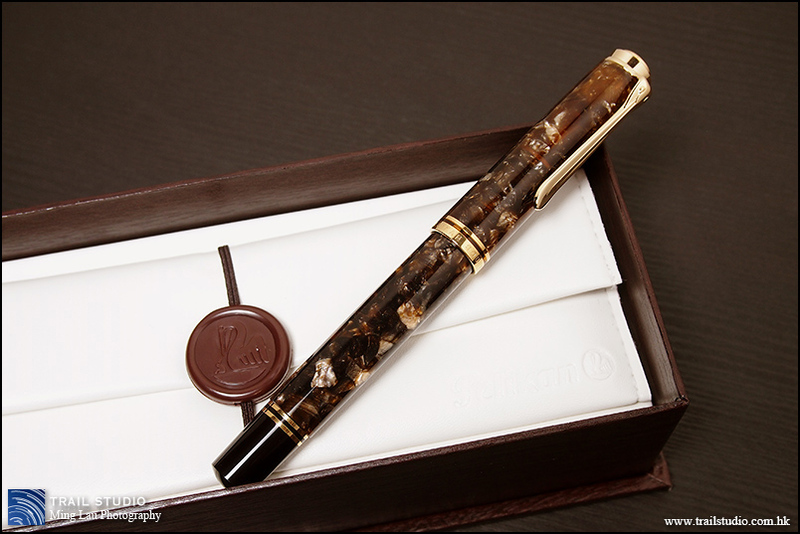 The basic shape of this special edition is the same as the standard M800, just that the standard black cap and the strapped celloid barrel are changed into the stunning brown acrylic. 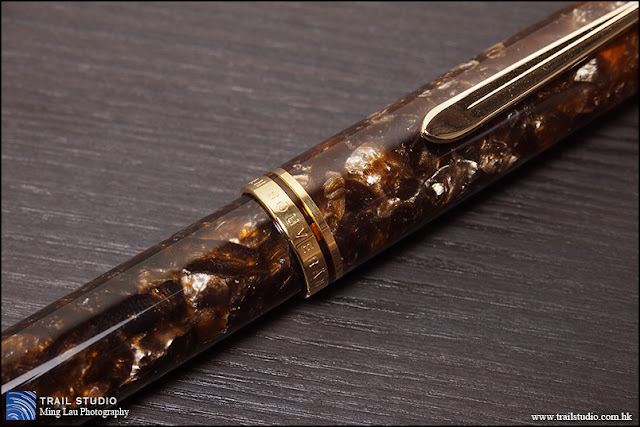 Some people argued that the beauty of an acrylic material is nowhere comparable to celluloid, I think if one’s willing to invest, one may get elegant acrylics, such as what Pelikan demonstrated in its great-looking special edition pens. Some sources suggested that these types of materials are possibly produced by mixing celluloid flakes into acrylic, yet to confirm. The M800 is the second largest pen in the Souveran line-up, many people suggested that it’s already too fat to grip comfortably and too back-heavy for a long writing session. 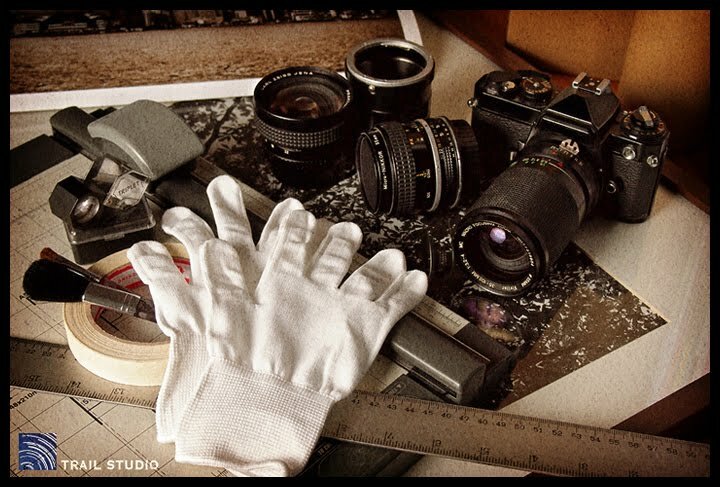 I got the same feeling especially as my hands are small even for Asian’s standard. I like heavy pens, but back-heavy can be a problem even if the pen is not really heavy, interestingly, the balance with the cap unposted is already bad enough that posting it doesn’t create additional badness for me. If you prefer a daily writer or a work-horse pen, perhaps stop at the M600. 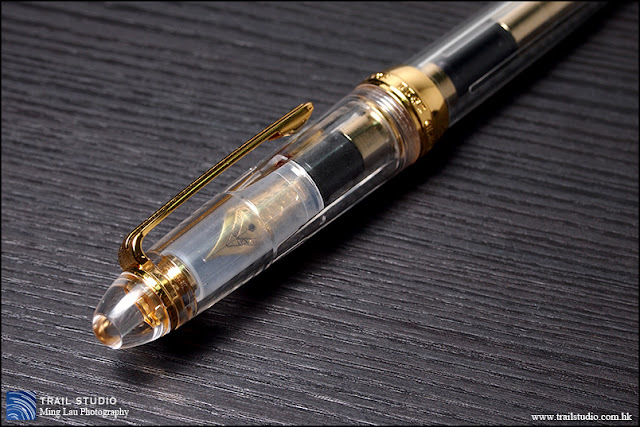 As with all Souveran pens, the M800 has a golden ring at the tip of the section, it looks nice but I’m worried that the plated gold will flake off over time due to ink corrosion, it is a common problem for golden rings located that close to the nib. To slow down ink corrosion process, Iron-gall inks should be avoided, clean and dry the pen thoroughly and don’t leave it inked when you don’t plan to use it for a long time, I know, it’s easier said than done specially if you’re an ink-holic. 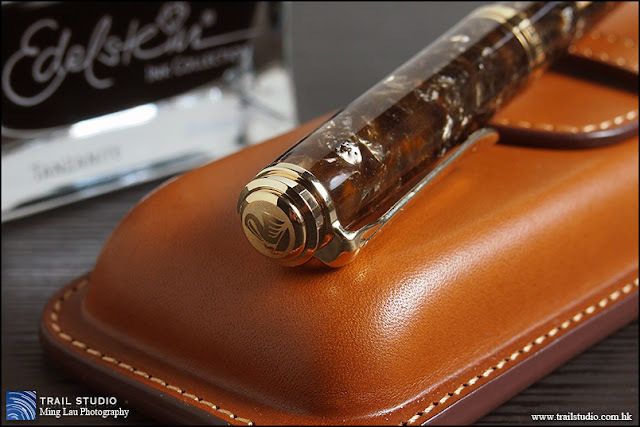 Pelikan manufactured the first differential piston filler fountain pen, if a piston-filler is a must-have in your collection, the Pelikan is a must-buy. The black finial (it’s actually a very dark brown) is the piston knob, a quarter of anti-clockwise turn will trigger the brass piston mechanism. This brass piston is robust and should last for many years, it adds heft (some people including me translate a bit of heft into quality) to the M800 over its smaller siblings with plastic pistons, but it is a double-edged sword for people like me with small hands, the back-balance problem gives me some less than peasant feeling when writing. It’s interesting to operate the piston, but the truth is, I dislike wiping a pen after dipping it into an ink bottle (and this pen is too fat for some bottles), I prefer syringe-fill my pens with no exception even for a Pelikan which is one of the best piston-fillers. Am I wasting a piston-filler in this regard? May be not, the Pelikan’s nib-unit can be screwed out easily for a quick syringe-fill. With a C/C pen, I’ll have to remove the barrel, then remove the convertor before I can do a refill, which is more troublesome.The barrel is slightly translucent, it’s ok (not that clear actually) to hold the pen under strong back light to check the approximate ink level. The pen comes with a standard M800 medium-grade 18K gold nib, with beautiful 2 –tone nib-work. It’s a hard nib but not to the extent of a nail, It’s easy to get a bit of line variation and ink shading with ease, there is a slightly stub-characteristic for this nib (which I like). It seems to be well-known that Pelikan pens write a bit wider and wetter than many other pens of the same nib-grade, it is not the case here, I think the flow’s just average or even slightly on the dry side, for example it’s dryer than a Parker Duofold M and even a Pilot C74 F. I even compare it with a MB144 B as well, I know it’s unfair to compare M and B nibs, but the 144 is much wetter to an out-of-proportion extent. Forgot to mention, I inked it with 2 of my familiar J.herbin inks which are also in my other pens for fair comparison, I didn’t try it with Edlestein ink yet as I received mine just a week ago. 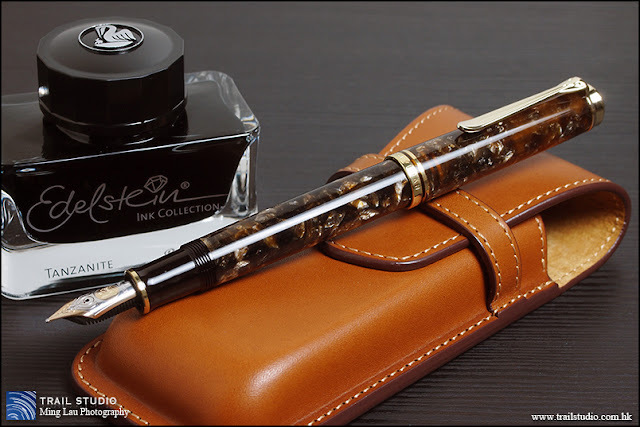 The Pelikan M800 may be a bit fat and back-heavy for some people to write comfortably, nevertheless it is an iconic fountain pen to be respected, and by throwing in a bit more money at the right timing, you’ll be able to avoid the standard, mass-produced M800 and get a special edition which is more unique and exciting due to the eye-catching material used. 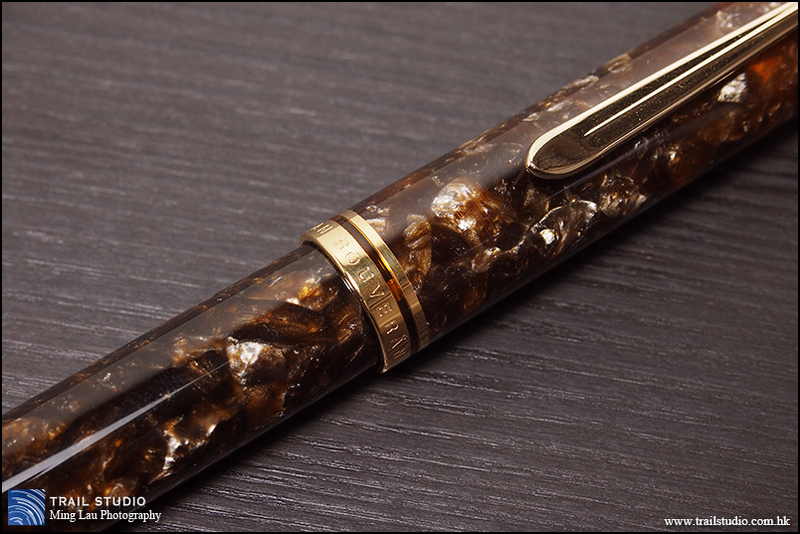 It’s not only a writing tool, but a jewel as well. If you ever come across a SE(or even a LE) and you know you want it badly, don’t wait as they will be sold out real fast. 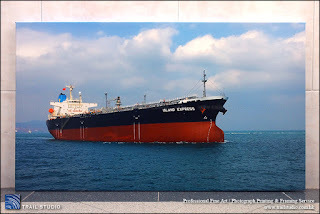 I'm switching to English Channel for the first time in this blog, see if I'll be able to meet some new friends around the world. 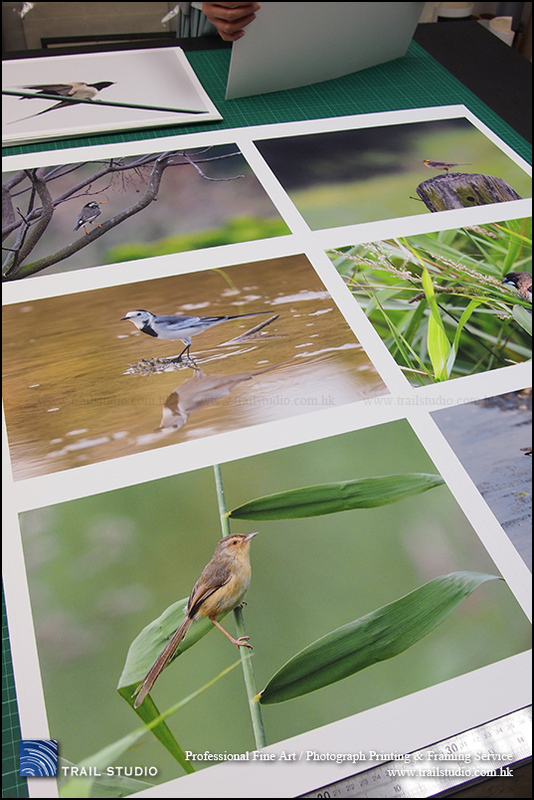 Here is an idea of my background, while many people in my place(Hong Kong) know me as a large-format photo printing specialist at Trail Studio. 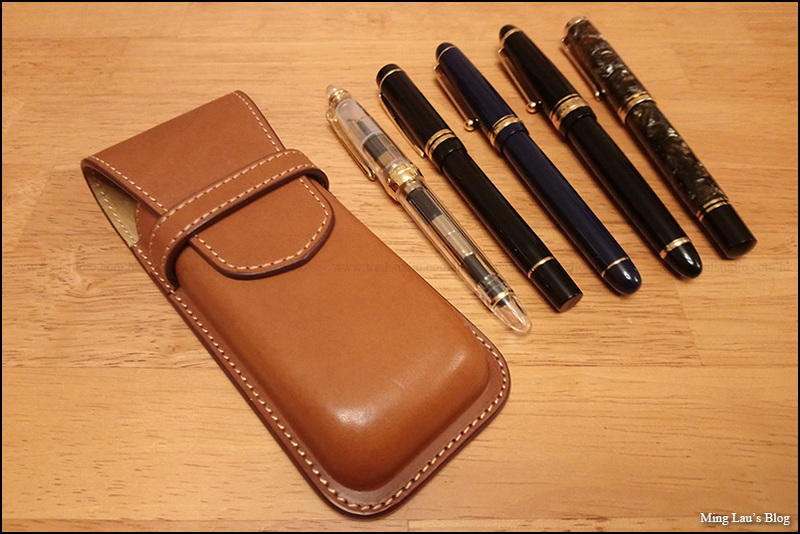 I'm also an experienced product designer with engineering & manufacturing knowledge, so I can apply my knowledge when talking about fountain pens. It seems to me that fountain pen is a matter of hit-or-miss. 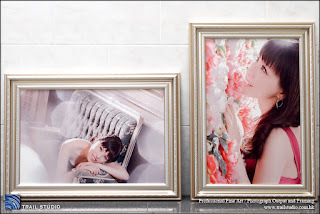 Problem is that, tolerance exists in every manufacturing process, it is not noticeable for most products, but is critical for fountain pen nibs, which require high precision as they rely on capillary-action to get the ink flowing. Unfortunately pen manufacturers aren't doing rocket-science, and some problems may have been caused by the handling of retailers as well. 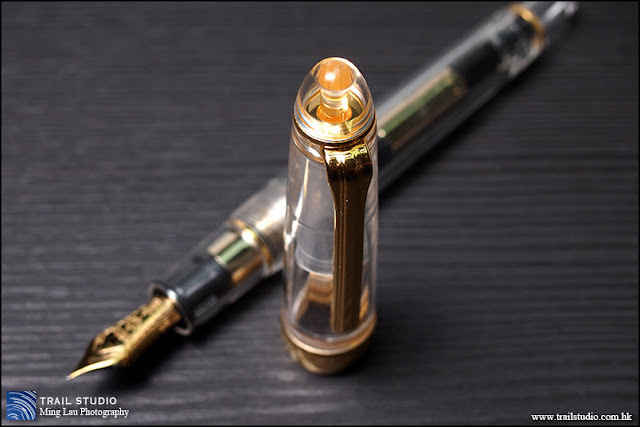 Whatever brand of fountain pen may have a good chance to go wrong, it's better to try the particular pen before you buy it, or to buy from nib-meisters who will test and adjust the pen. Or, at least read some reviews before making your purchase. 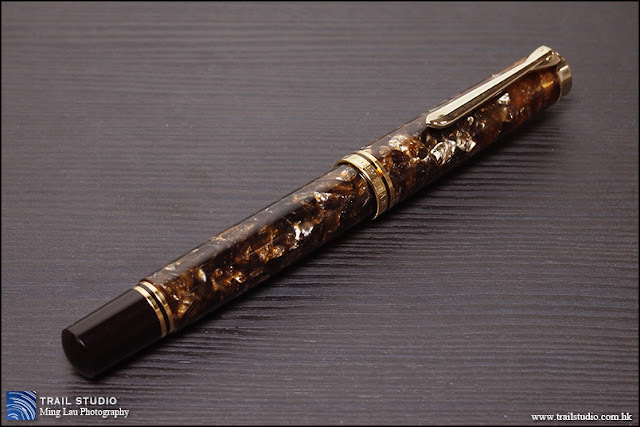 So, here is my contribution to the great community of fountain pens. 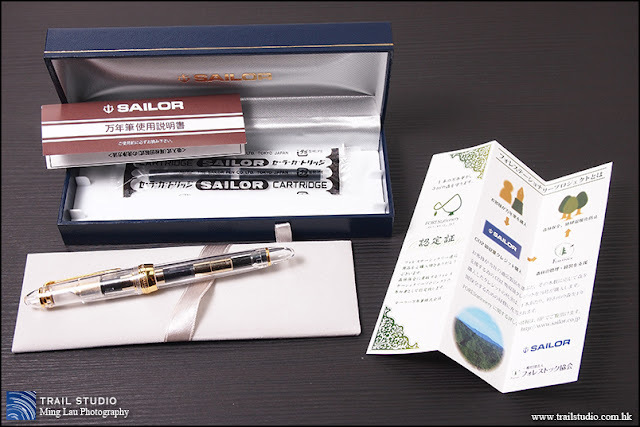 Here we go, Sailor is one of the well reputed "big-3" Japanese fountain pen manufacturers, the other 2 being Pilot and Platinum (where is the Driver? 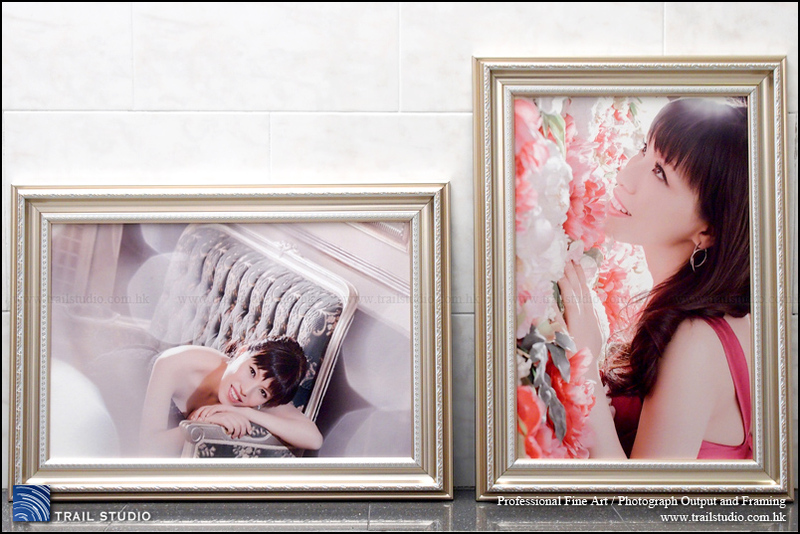 Just kidding :D). I didn't care about the Japanese pens in the early days of my pen journey as they look plain and boring, until I acquired some Pilot fountain pens and realized how precise the nibs were and how great the writing experience was. 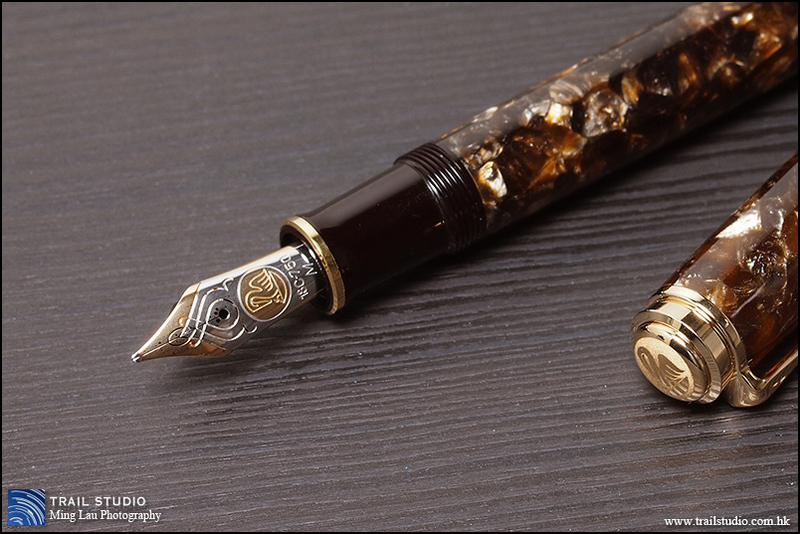 The Japanese Fountain Pen manufacturers should be well respected because they are the very few contemporary ones who still manufacture their own nibs - the soul of fountain pens. 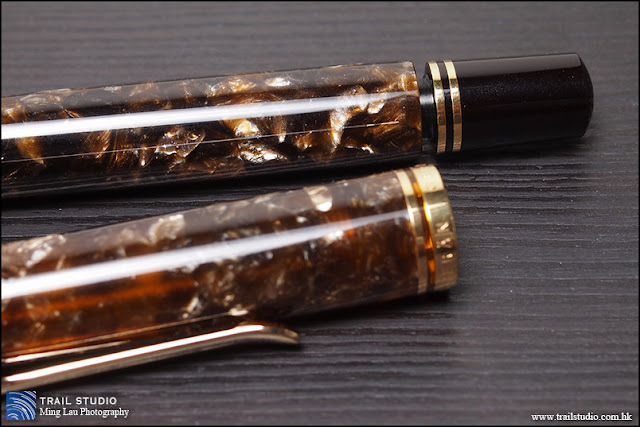 They are able to offer a wide variety of nib options, giving unique characteristics to their pens. 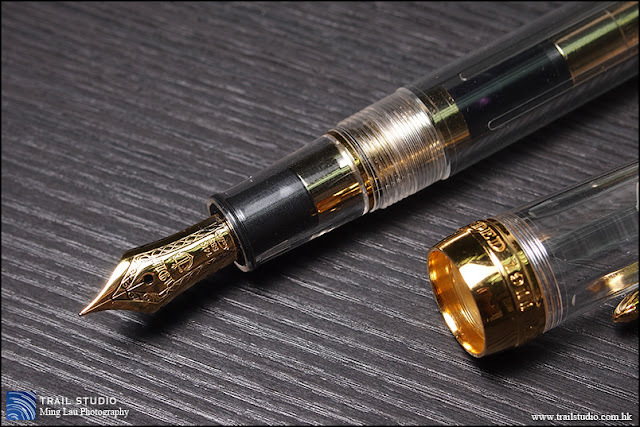 To be fair, some of my Japanese pens have issues just like their western counterparts, the gold-nib pen which gave me the most trouble ever, is another popular Japanese Pen, the #3776, I’ve made intensive adjustments to get it work well. Indeed I had worked on about 1/3 of my "branded" fountain pens to get them write well. Some people consider the Sailor 1911 (as well as whatever black/gold cigar pens) as Mont Blanc knock-off, but to me the 1911 is just another cigar-shaped pens with basic(or classic) constructions. 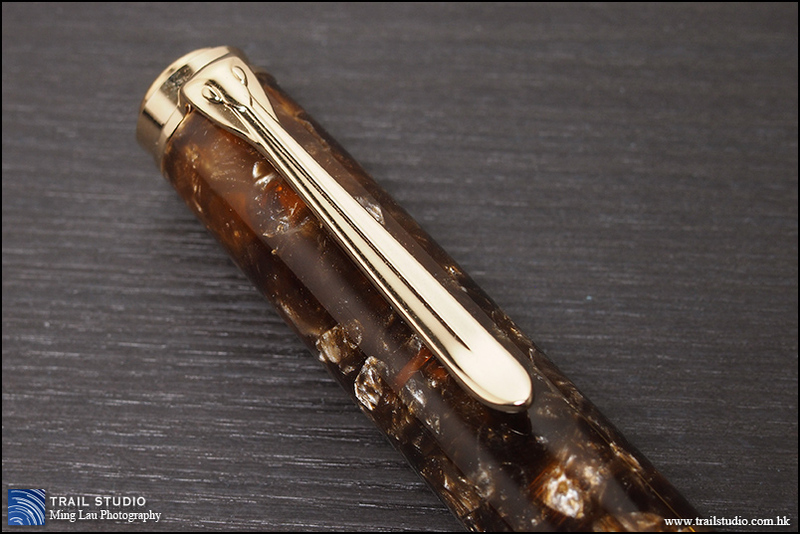 Many online sources suggested that the archetype of black/gold cigar-shape pens is the Sheaffer Balance, first introduced at around 1929 which pre-dated the MB Masterpiece line. I don't consider the 1911 as MB knockoff, but I can't control what people think. I use my pens in business environments, to avoid confusions or misunderstandings, I'm forced to avoid the black-body 1911. 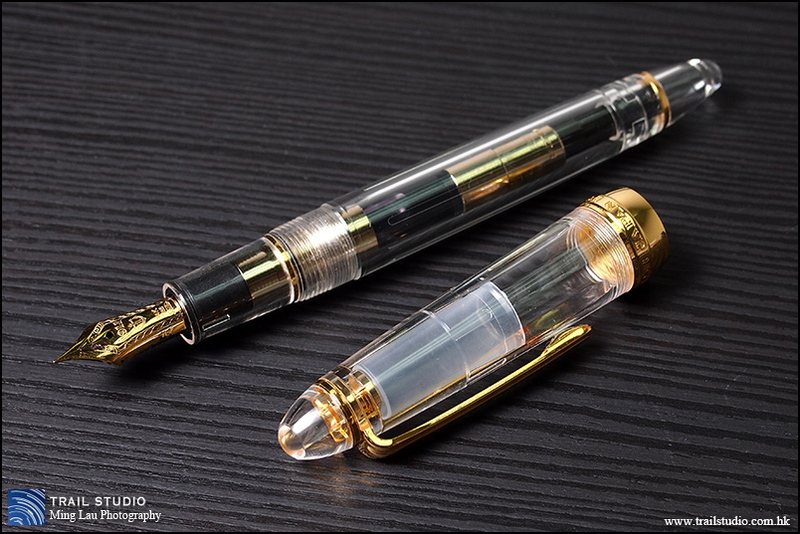 I've been eyeing this demonstrator model for a long while, but a golden-converter was unavailable at the time, the chrome one was a poor match to the gold-trim (same case as the Platinum 3776 Nice), so I didn't pull the trigger until I realized a golden converter is actually available. This is a 1911S demonstrator, S stands for "standard-size". The Japanese pen was aimed for their own market, so it is a ok for we Eastern people to use it unposted. However, for Western people with larger hands, the “S” should in real-life stands for "short" or "small", and the cap probably has to be posted before use. 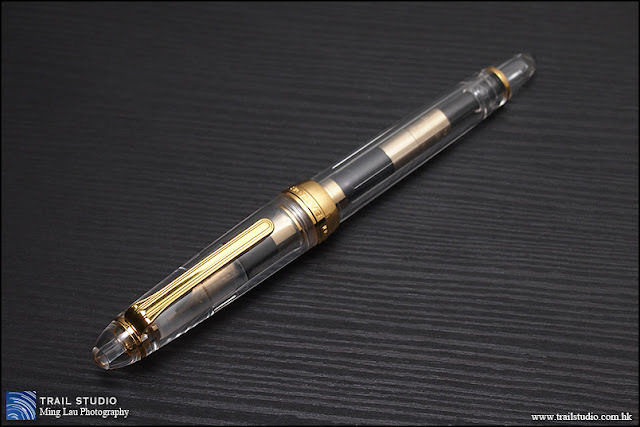 For a pen of such a small size, the metal piece in the section make this pen heavier than what it appears to be, and make it well balanced either with the cap posted or unposted. Some heft in a small body can mean quality to some people, including me. I like big pens, but for the 1911 demonstrators, I prefer this 1911S over the 1911L because I love the proportion of the smaller barrel to the inner workings(i.e. the piston converter) - there is not much empty space inside the pen, it's transparent but not hollow, and reminds me this pen is small but practical. In contrast, the internal space of the barrel of the 1911L demo looks a bit wasted to my own taste, it also reminds me the Sailor converter is of low ink capacity and doesn't utilize the advantage of the larger pen body. Anyway, if you’ve big hands, it's better to get the 1911L. Here comes my biggest criticism – the cap doesn’t post well. 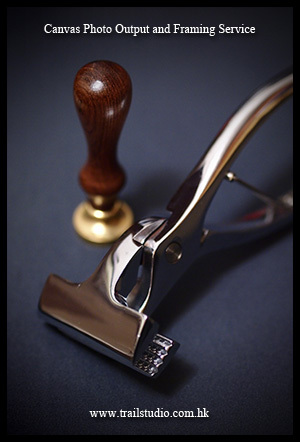 It is friction-fit, but the area of contact between the barrel and the cap is extraordinarily narrow, you'll need to press hard to produce sufficient friction and you know you'll scratch the pen very soon. More to the problem, resting your hand not exactly on that narrow ring-of-contact will create a leverage and wobble the cap slightly, that's annoying and is enough to break the friction all in a sudden, the cap may then fall out easily as the tapered barrel can't encase it. 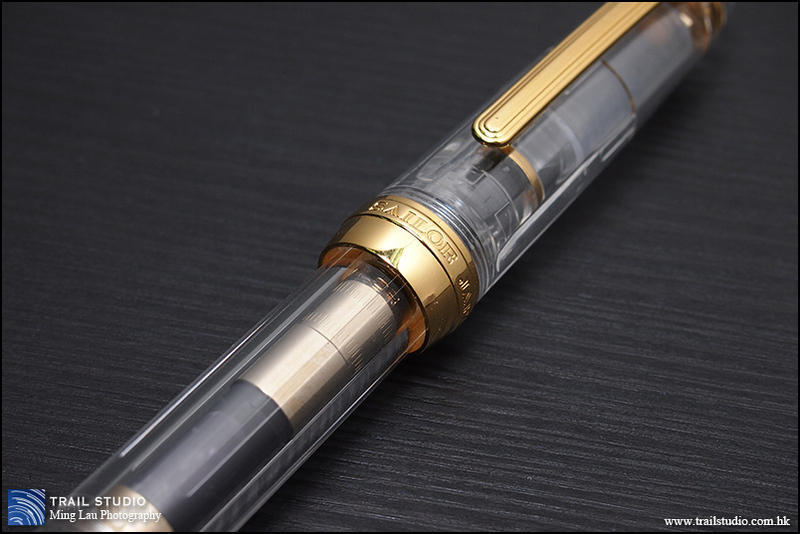 I suspect this problem is unique only to the demonstrator model with large single metal cap-ring, as the cap opening is made larger to avoid the metal ring from scratching the plastic (or "precious resin") of the barrel, it looks great but doesn't work well. Now comes my second complaint about this pen. Many of us get used to flush the section before use, or when changing ink (the maintenance procedure is written in the user manual as well). Unbelievably, doing so is not good for this pen! Water will run through 2 little trenches at both sides of the feed collar (the black plastic part) and trapped inside the clear section if you flush it the usual way. 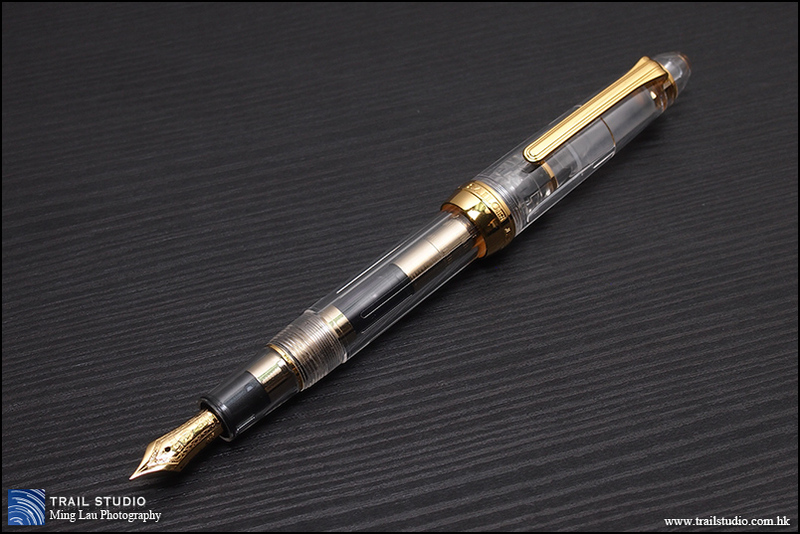 I had to disassemble the pen and wait for 1 or 2 days to have the water evaporate. If ink goes inside this space it will be difficult to wash it out (perhaps try using syringe), and it may stain or corrode the metal, that will be ugly. I guess the best way to clean the pen is to keep the converter attached and soak the water up through the nib, or to flush it with the nib ALWAYS facing upwards. The pen clip wobbles sideways a bit, not ideal but no big deal. I like the shape of this old-clip far more than that of the "Sigma" or "Mk.ll" version. 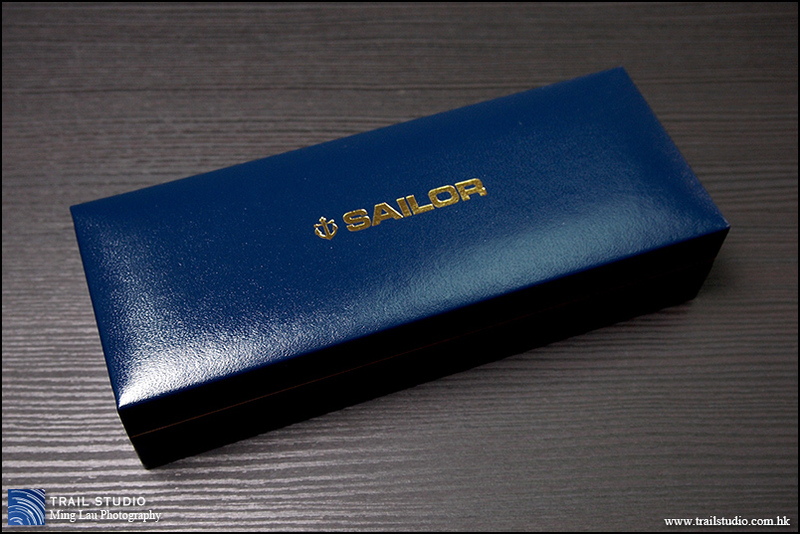 To me, the clip of the Sigma version looks like a skateboard, and the anchor-shape thing on it is too big and looks "cartoonish". Sorry to say that the new clip design effectively stealth those new Sailor pens from my radar. For a demonstrator pen, it's always a good idea to display the nib with the use of a clear-enough inner cap. The inner cap of this pen is not spring-loaded like the Platinum#3776, but it's quite elastic and is able to create an air-tight seal, I didn't experience hard-start or ink drying-out even when the pen is left inked for 2+ weeks. The plastic column inside the top of the cap looks like a cap jewel, a nice touch. 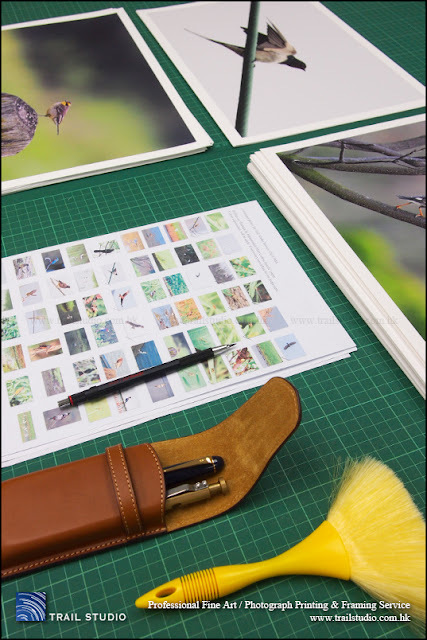 Another great feature with demonstrator pen is that, you are able to immediately know how much ink is left and what ink you're using without unscrewing the barrel. As mentioned, the ink capacity is low, I didn't actually measure it, by observation the cavity is short and narrow, and ink level drops fast even that I'm not a heavy pen user and the nib is relatively dry. The converter can be dissembled easily by twisting the metal collar, pay attention not to twist it when you operate the piston, otherwise it may lead to ink leakage, I bet you don't like to demonstrate this. It's good to put silicon grease inside of this collar and around the piston knob as a safety measure. 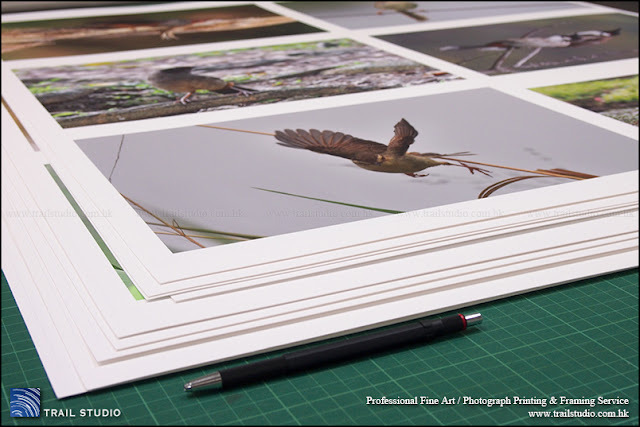 The nib art is appealing, it is marked as H-F (hard fine) and writes relatively dry, with some feedback on certain papers. It writes finer than my other japanese fine-nibs. The feedbacky feel is consistent across different writing angle and directions, and since the first day I inked it, this means the nib is well-ground. I've inked it with several J.herbin inks, which all worked well so I didn't try other inks, I'm afraid there'll be flow issues if thicker/more viscous inks are to be used. It's easily one of the hardest nibs I've ever used, you won't get much line variation unless you press it real hard, but the relatively tapered tip allow the nib to get some barely noticeable "initial spring", I mean, the slit opens very slightly when it touches the paper and then stopped there, not enough to produce noticeable line variation, but sufficient to pour down a bit more ink to produce nice shading. I'm very happy with the performance of this nib. 1) the tipping material is smaller and it writes finer than the other Japanese "F", it's probably EF by Pilot's standard. It's just not easily noticeable especially as the "initial springiness" widen the line to the other Japanese "F" standard before firmly stops there. 3) it's really nail-hard (the "initial springiness" I mentioned isn't noticeable at all) so there's no damping when the nib glides across the paper. Besides viewing under a loupe, one easy way to distinguish between a good feedbacky nib and a faulty scratchy nib, is to draw a horizontal straight line, then draw again in backward direction, and repeat with lines of other angles. If the nib is significantly scratchier on some lines/directions, chance for a mis-aligned slit or a deformed tip is high. This is a great c/c demonstrator pen, and for people with big hands, it is especially excel as an EDC pen: small thus handy, with a little bit of heft but not heavy, most importantly it writes really well. It is eye-catching with its crystal clear body and gold trims, and people can easily tell it's a fountain pen - a good tool for fountain pen addicts to reveal their identity! With this pen, you always know how much ink is left so there’s no worry about running out of ink in a sudden - a good feature for an EDC pen as refilling it on-the-go is usually not an option. Unfortunately the cap doesn't post well, and can be a problem for EDC pens in situations like jotting quick notes without a desk, it's still ok if you pay attention, just don't lend the pen to the others with the cap posted. 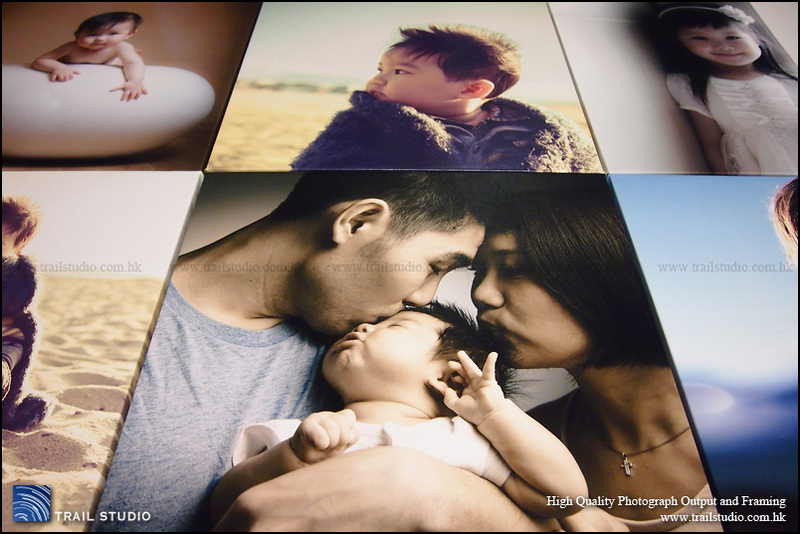 Art Grade Photo Printing, Canvas Printing etc. Click the above image To enter website. Copyright Ming Lau. 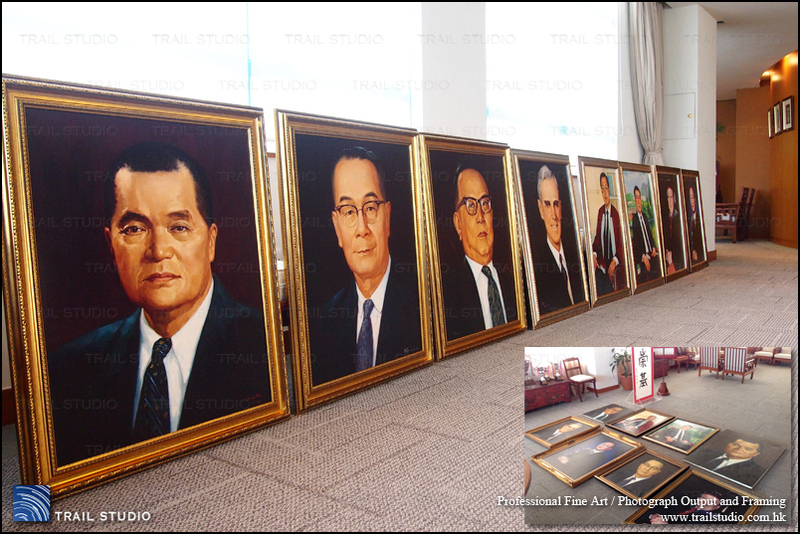 聯絡: enquiry@trailstudio.com.hk. Awesome Inc. theme. Powered by Blogger.